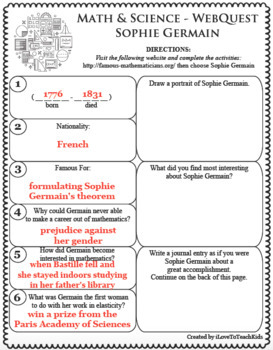 FAMOUS MATHEMATICIAN - Marie-Sophie Germain was a French mathematician, physicist, and philosopher. 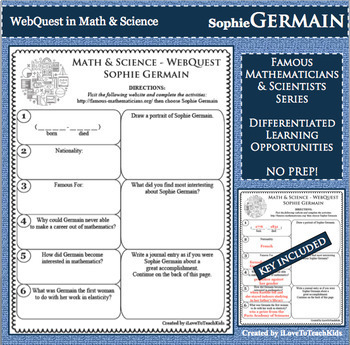 Engage your learners in fun, interactive, and creative ways to discover more about SOPHIE GERMAIN using this WebQuest. 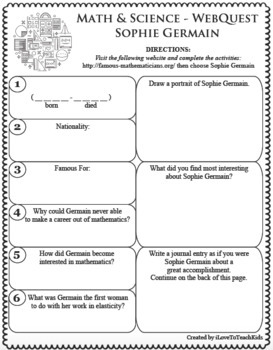 Activity is differentiated allowing students to respond to open-ended questions reaching individual levels. INSPIRE your students!